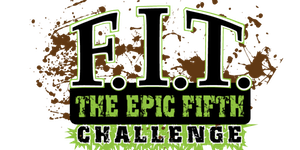 The Epic Fifth F.I.T. 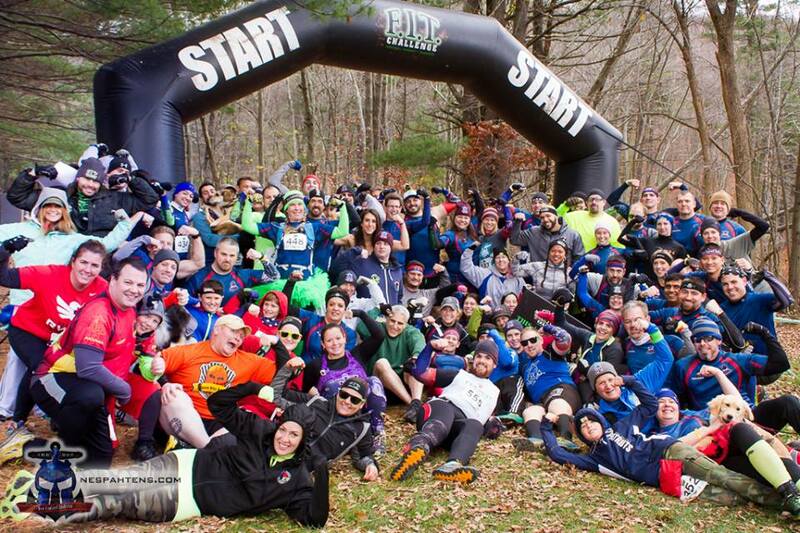 Challenge is the last OCR I will be doing for 2015. It was a short race, only 3.68 miles, so I was not too worried about it. It was also a small race, with only 500 participants. I had not seriously exercised since the Killington Beast, but I was not too worried, but now that the race is over, I wish I had trained more for it. I convinced sister Kathy, brother-in-law Dave, and my nephew Seamus to do the race with me. Seamus was excited, but Kathy was more nervous about it. The venue was Diamond Hill State Park in Cumberland, Rhode Island. Traveling there was easy, and brought back some memories of when I was a kid and we frequently traveled to that area. Arriving at the venue...it felt like November. It was cold (mid 40s) and windy. I wore a sweatshirt and pants over my racing gear, only taking them off at the last minute. I had intended to run the race with Kathy, Dave and Seamus, all of us keeping together for mutual moral support, but Seamus wanted to go ahead, so I stayed with him while Kathy and Dave lagged behind. The first part of the race was up Diamond Hill, which, while not nearly as high as Killington, was rockier, and in some places just as steep. The first half of the race was primarily going up and down the hill, clambering over rocks, with only a few obstacles to break it up. They included a few walls, a few inverted walls, a cargo net, and doing a bunch of reps lifting a 45lb. barbell. I helped Seamus do his reps, and then did my own after his. Back to the main part of the course, we found some pretty interesting obstacles--some of them I’ve never seen before. First was a peg climb--similar to the “Liberator” at Tough Mudder, but this wasn’t quite as high, but it was vertical rather than sloped. It was only a short way up the tree, but I found that my upper body strength was not up to the task, and the cold didn’t make it any easier. Next was a rope climb. I made it a short way up, so I was able to demonstrate the technique to Seamus, but I could not make it to the top. I really need to buckle down over the winter and get in shape. After that was a climb onto one log, and from there up to another one. I boosted Seamus up, and he was able to do it, but I needed help to do it myself. Following that was a carry--a wreck bag up the hill and back down. Seamus took a 25 lb bag while I took a 50lb. Seamus had trouble keeping his on his shoulders, but he managed the entire carry without help, and was proud of it. 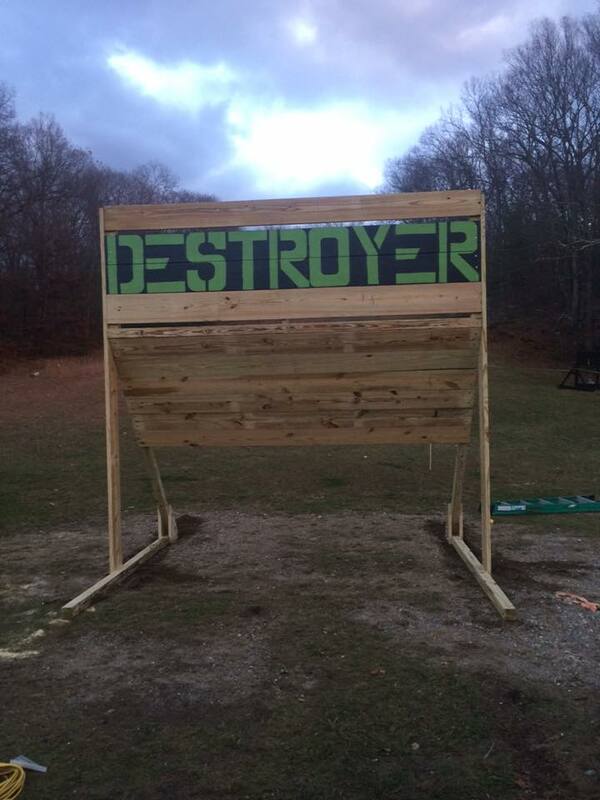 Next was the Destroyer. Both of us looked at this one with some trepidation. It was a wall with some handholds, perhaps 12 feet high, and the bottom 2/3 sloped away from the climber. Seamus did it with a boost, and was rightfully proud of that one. I tried it myself, slipped and fell off, tearing some skin off a finger. I tried it again, this time with a little help and coaching, and managed to get over the top. Again I was reminded at how I need to up my game. Back up the hill for some trail running and the last mile of the race, and the last obstacles. There was an interesting wall that looked like a simple climbing wall, but it hung from trees, and was not attached at the bottom so it could swing freely (the "Floating Wall"). Me and another racer boosted up Seamus, and then I tackled the wall myself. I did it, but my calves both cramped up badly. Next was a series of over/unders, and then a variation on an Atlas Carry--you had to lift up an Atlas ball and push it over your shoulder five times. After that was a rig, which I always have difficulty with. First was monkey bars and then to another hanging pipe, and then a cargo net. Seamus managed most of it, but I only could do a handful of monkey bars. The cold, my numb hands, my loose shoulders, and my strength in general was just not up to the task. 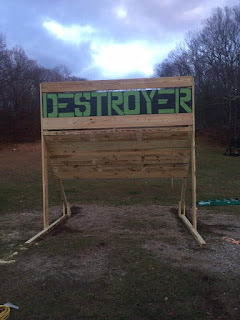 I did the Cargo net and then onto the last obstacle, an inverted wall, and then over the finish line where Seamus met me. Seamus and I rested for perhaps 15 minutes until Kathy and Dave showed up, and then we cheered them on until they finished. It was a good race, with some challenging obstacles that I hadn’t seen before. All in all though, I really need to work harder to get back in shape--especially to lose some weight, which will help with everything.